Welcome to my part 2 of Aircraft Recognition Guide! Photo of KLM's MD-11 taken at Amsterdam Airport in 2005. 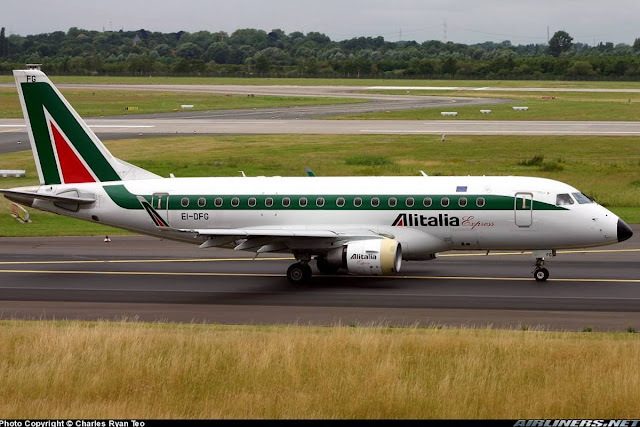 *These photos are credited to the following photographers from Airliners.net and Jetphotos. There are a few photos taken by me, do enjoy them! This company is based in Montreal, Canada. It deals with not just regional and business jets, it also deals with light rail and railway system. 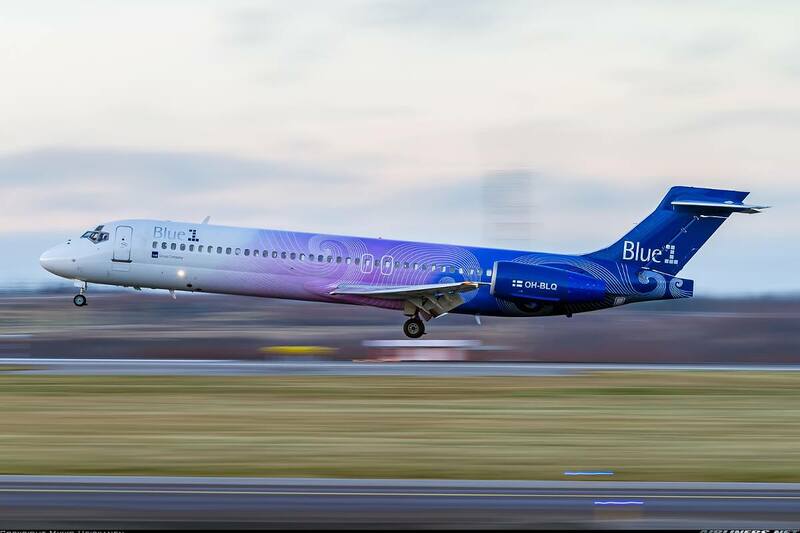 Recently, it launched the CS100 and CS300 aircraft which compete directly with Airbus A320 NEO (New Engine Option) and Boeing 737 MAX, this makes the aviation world even more exciting than it is. The CRJ-100 was stretched 5.92 metre from the CL-600 design, with some mortification such as 2 emergency windows and a strengthened wing and this plane was rolled out in 1991. General Electric CF34 turbofans is the sole engine supplier for this aircraft type. The -100ER (Extended Range) and -100LR (Long Range) were built for airlines requiring more range with the same capacity and this aircraft type suits some of the corporate and executive operators perfectly. 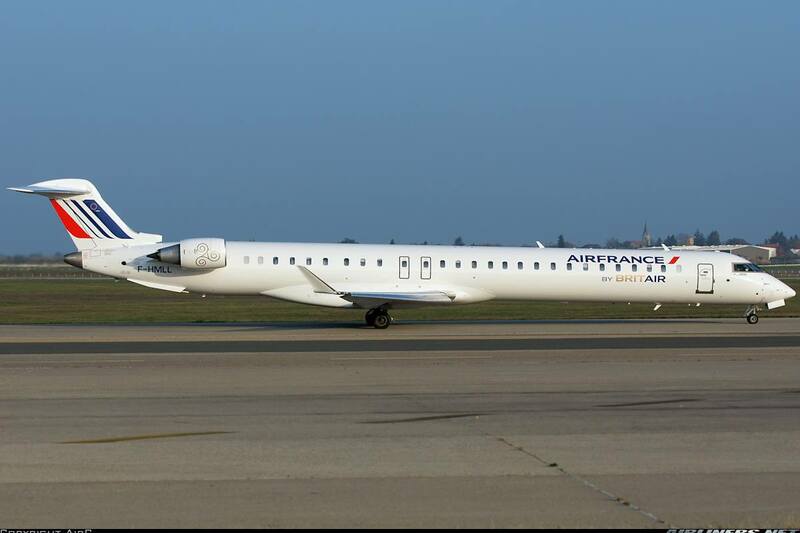 The difference between CRJ-100 and -200 is the engines. It is using the General Electric CF34-3B1 engines. There is the normal version, ER (Extended Range) and LR (Long Range). 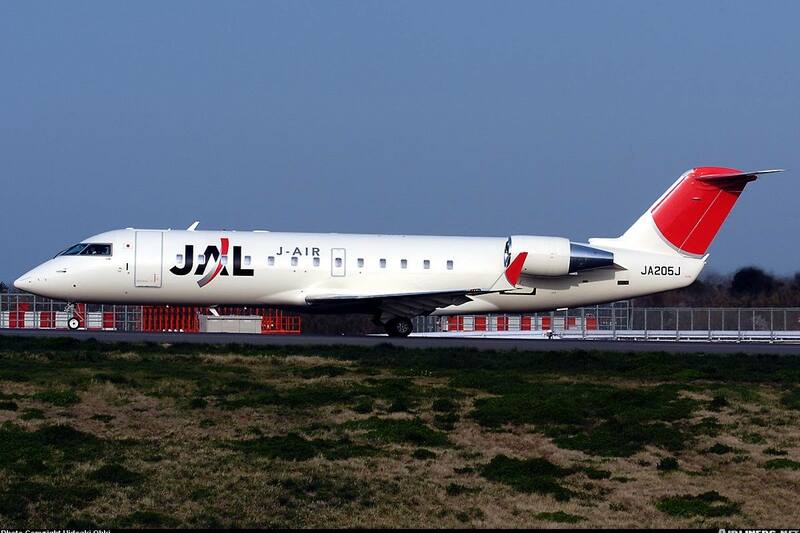 Appearance of this aircraft is the same. This aircraft is build as a stretched version of the -200 series, it can hold 70 passengers. This series comes in 3 versions: Series 700, 701 and 702. What are the difference? The 700 is limited to 68 seats, 701 is limited to 70 seats and 702 is limited to 78 seats. This aircraft also has 3 fuel options, the LR (Long Range), ER (Extended Range) and the standard. Sounds complicated? This is to meet the requirements for the airlines. 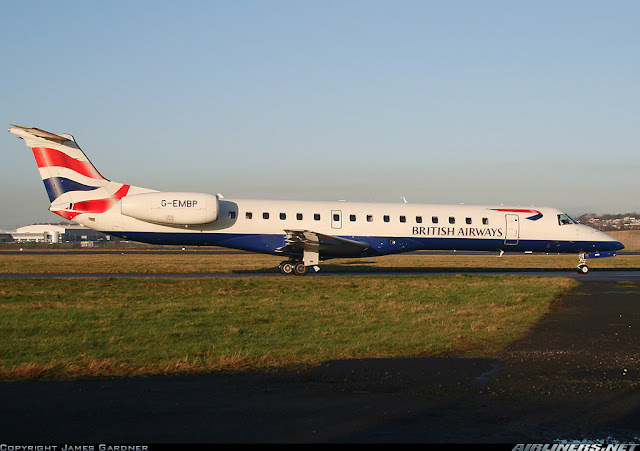 The first CRJ 700 to enter in service is with Brit Air in 2001. This is Hop's CRJ700, for this case the -702 series. No difference in appearance for the 3 different versions. 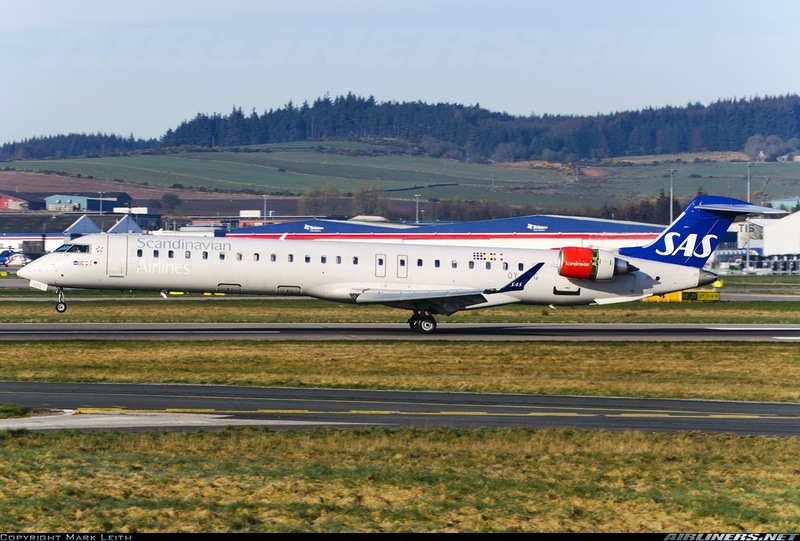 The CRJ900 is a stretched 76-90 seater version of the CRJ-700 and an upgrade over the -200. With upgraded engine and improved cabin, this aircraft proved to be more popular than the other series. The tail is re-designed and has longer wings compared to its older siblings. The CRJ700 series 705 is based on the this series, with business class cabin and lower capacity for regional airlines. 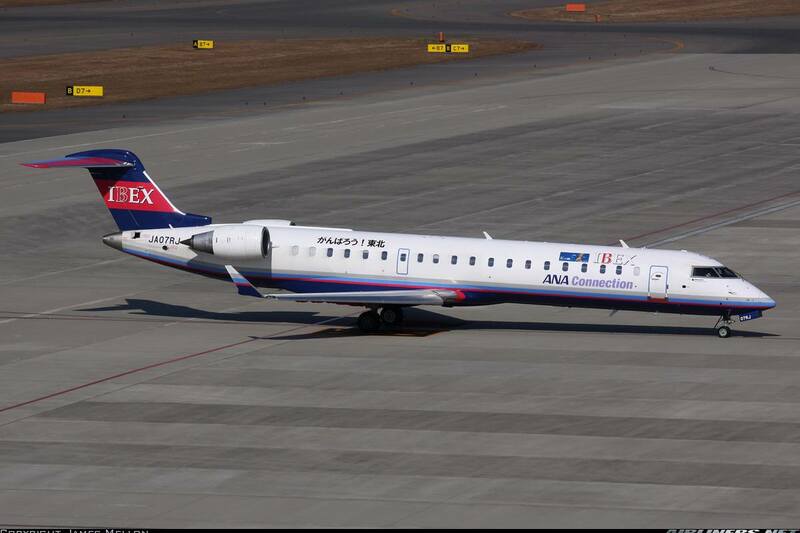 This is the latest Regional Jet by this company. It is a stretched version of the -900 series with a capacity of 100 seats. However, there isn't many orders for this type and I am fortunate to have flown on one with Garuda's aircraft, you can check out the trip report over here. 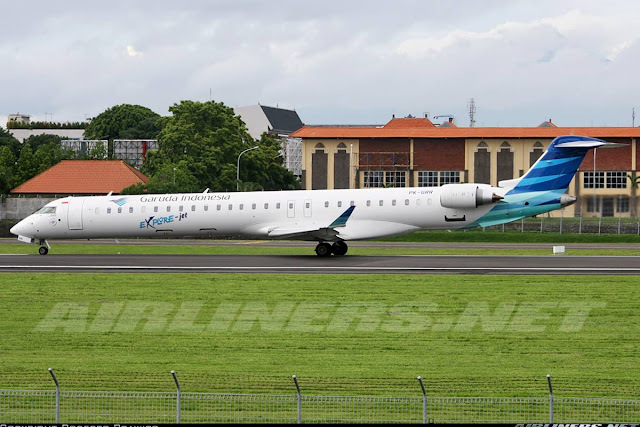 Garuda's CRJ1000 in SkyTeam Livery! Now known as Airbus A220. For the updated information, you can check out the information at this page. Bombardier has re-designated the C110 and C130 to CS100 and CS300 respectively to give Airbus and Boeing some competition in the 133-160 seater category. 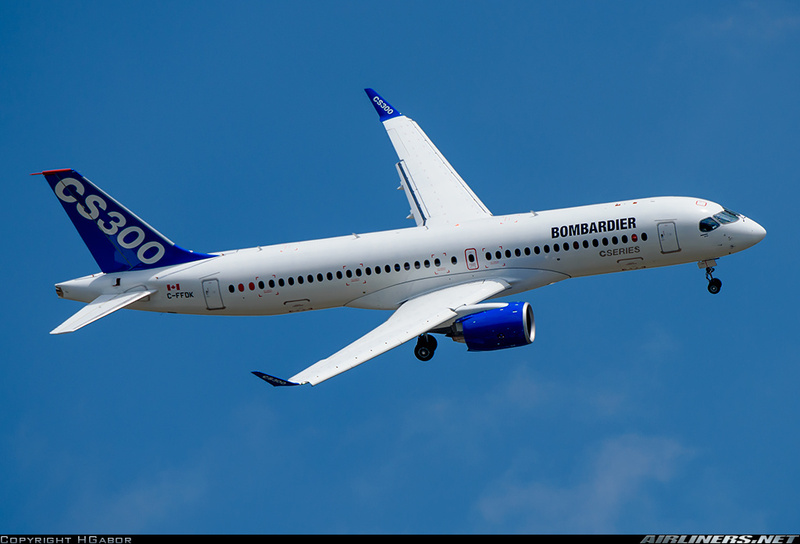 The manufacturer has delayed these aircraft for quite a few years since 2012 and finally the first prototype of the CS300 series took off on 27th February 2014 and then extensive tests of the aircraft took place to prepare the aircraft for certification for commercial series. This is a long process which the manufacturer has to do many tests to prove that it is safe for commercial service. As for now, Air Baltic is confirmed the launch customer for the CS300 and the first aircraft to be delivered in September 2016. A possible CS500 with a cabin configuration of 160 to 180 to compete with Airbus' Airbus A320 and Boeing's 737-800 is possible but this is still a rumour. The house colours of Bombardier - CS-300. Its longer than the CS-100. This is subjected to changes as the manufacturer continues to test and improve this aircraft. Embraer S.A is a Brazilian Aerospace Conglomerate that produces commercial , military and executive aircraft. 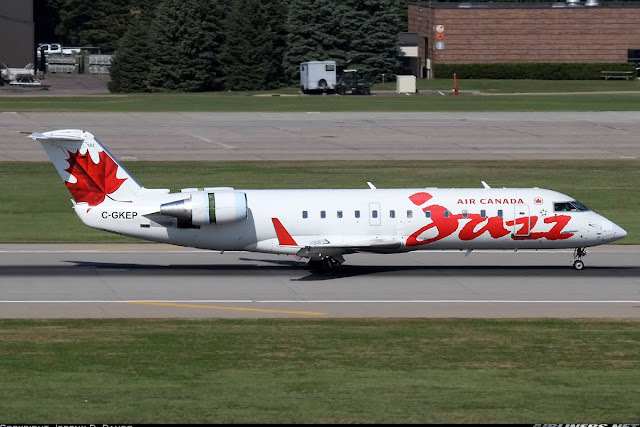 Its a direct competitor to Bombardier Regional Jets and was set up in 1969. Currently the 3rd largest aircraft manufacturer behind Airbus and Boeing and this company is based in Sao Paulo, Brazil. This is the smallest and probably the oldest jet in Embraer's family. 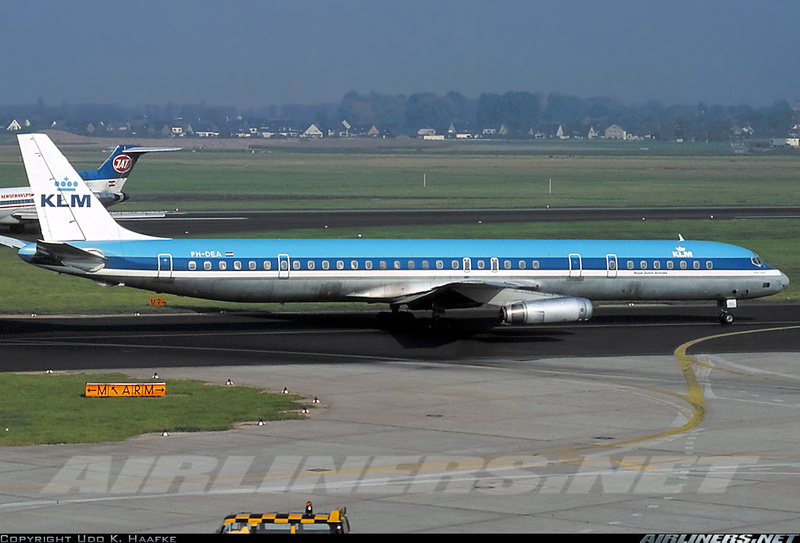 Designed to carry around 30 passengers, this aircraft made its debut in 1968 and gained orders for around 80. Embraer built this aircraft in 1974 and it consists of 3 designs, EMB 120, EMB 121 and EMB 123. 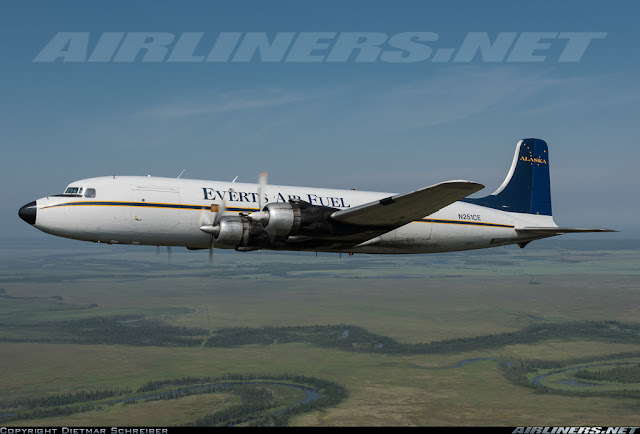 This aircraft is the closest replacement for the DC-3. 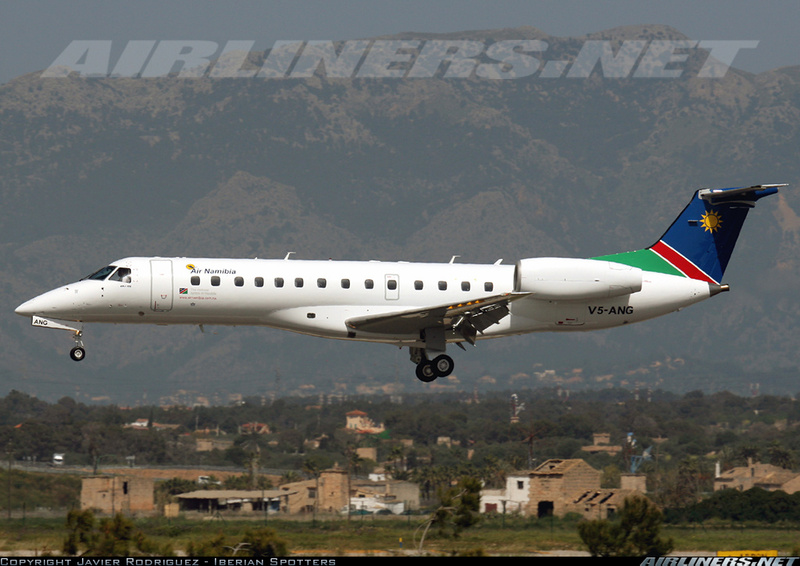 This is Embraer EMB-121 Xingu, the design is based on EMB 110 but with an all-new fuselage making it an improved aircraft. This section on Embraer jets onwards should be more familiar to the aviation spotters. The ERJ-145 family consists of ERJ-135 (37 passengers), -140 (44 passengers) and -145 (50 passengers) series. Unlike the older siblings, this series and onwards are powered by turbofans engines. This E-Jet family was launched by the manufacturer in 1999 at the Paris Air Show and entered production in 2002. This E series consists of 4 types - ERJ 170, -175, -190 and -195. Main difference? Capacity and range. These aircraft have winglets to improve efficiency. The manufacturers announced plans in November 2011 to revamp its current models with improved engines rather than coming out with a new aircraft. This new jets would have larger engine diameter fans. slightly taller landing gear and improved wings. The airline is still working on this aircraft type and the date of its first flight is not yet known. 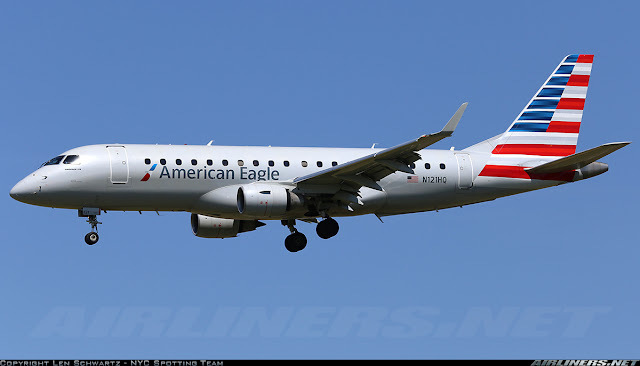 American Eagle's ERJ-175! Slightly longer than the -170 series. This company was set up in 1921 by Donald Wills Douglas and later merged with McDonnell Aircraft in 1967. Douglas was in control of the McDonnell Douglas (MD) after the merger but due to financial crisis, it was taken over by Boeing in 1997. Sadly after that, Boeing stopped production of the MD aircraft. I will focus only on commercial aircraft. 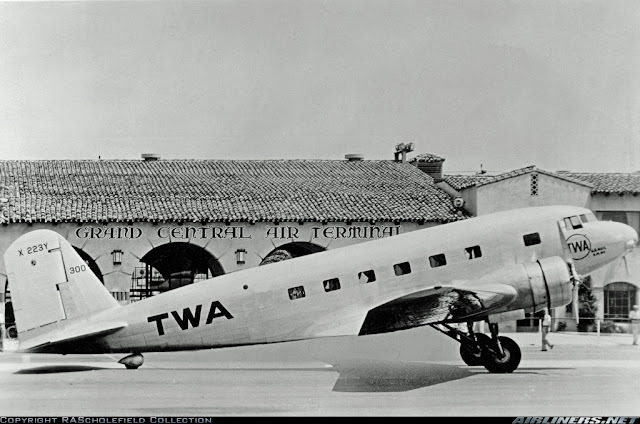 Only 1 aircraft was built and it made its debut flight in in 1933. 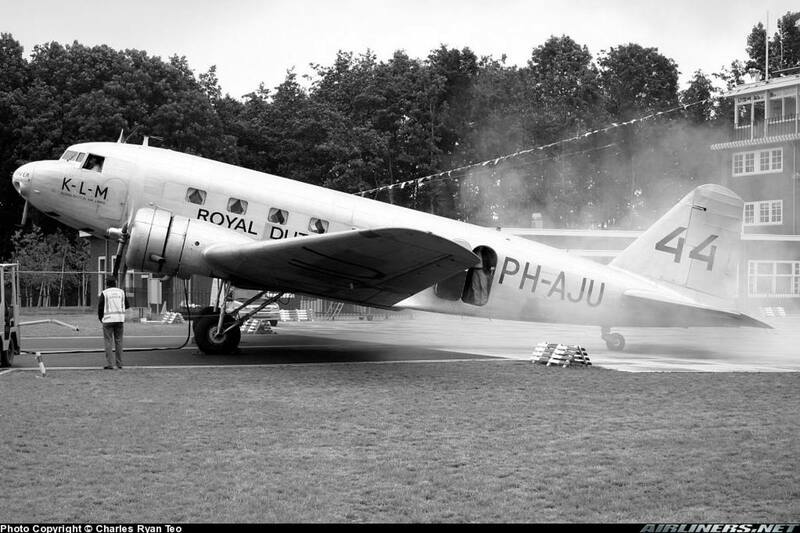 The manufacturer added more powerful engines to this airframe and called it the DC-2. 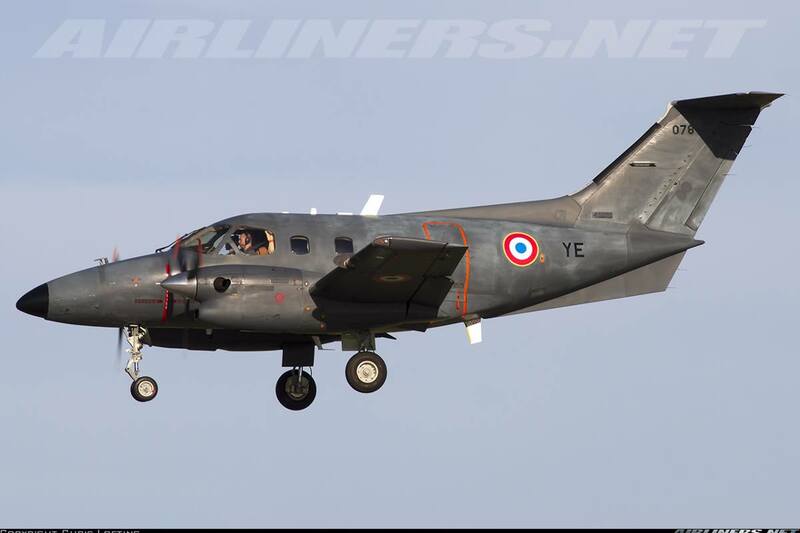 This aircraft can carry 12 passengers and 2 pilots and fly up to 1,610 km. 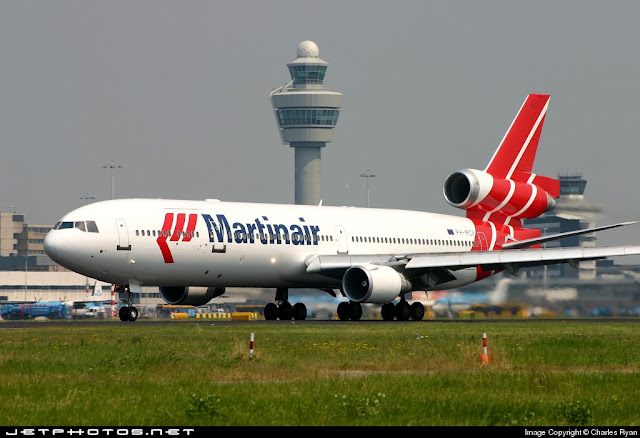 This aircraft is a 14-seater twin engine airliner, an improved version of the DC-1 with more powerful engines. It is also slightly longer than its older sibling and can fly up to 1,085 km. 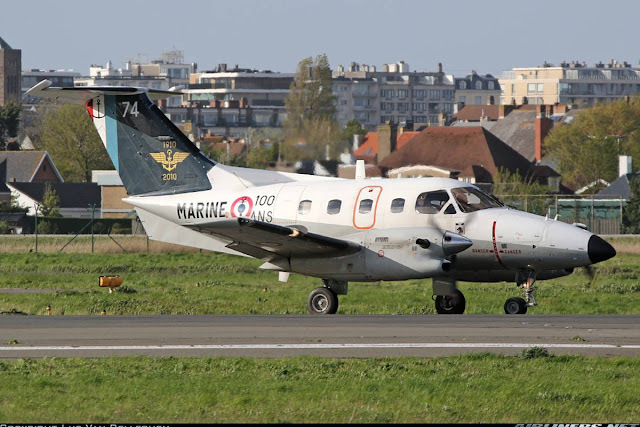 I was fortunate to caught sight of this at Lelystad Airport, photographed it doing its engine start-up as it was being prepared to do an air show performance. At that time, this was the world's only DC-2 in airworthy condition. This aircraft type became the most popular during the mid-1930s. 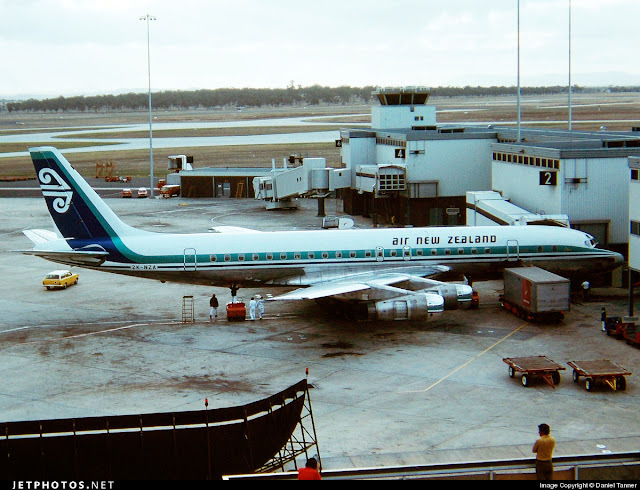 Many airlines ordered this as it proved to be a reliable and efficient those days. 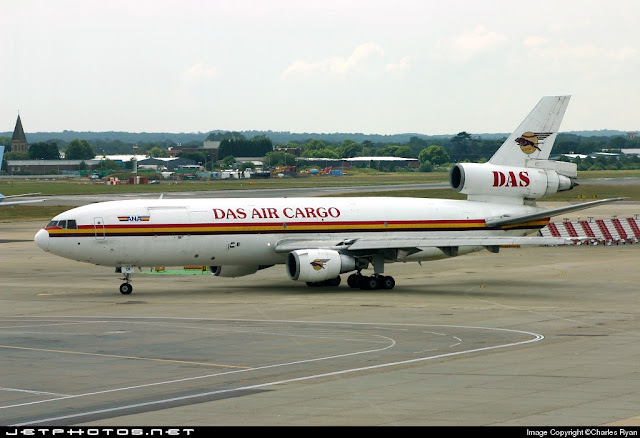 This aircraft can still be seen flying around today for cargo carriers and chartered aircraft but not in many places. 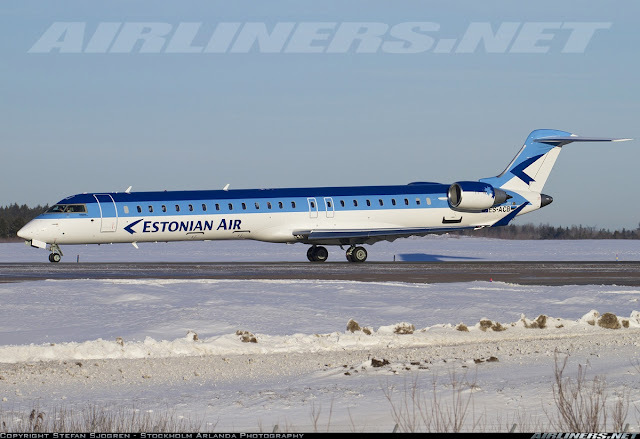 This aircraft can hold a capacity of 21-32 passengers depending on configuration and can fly up to 1,200 km. 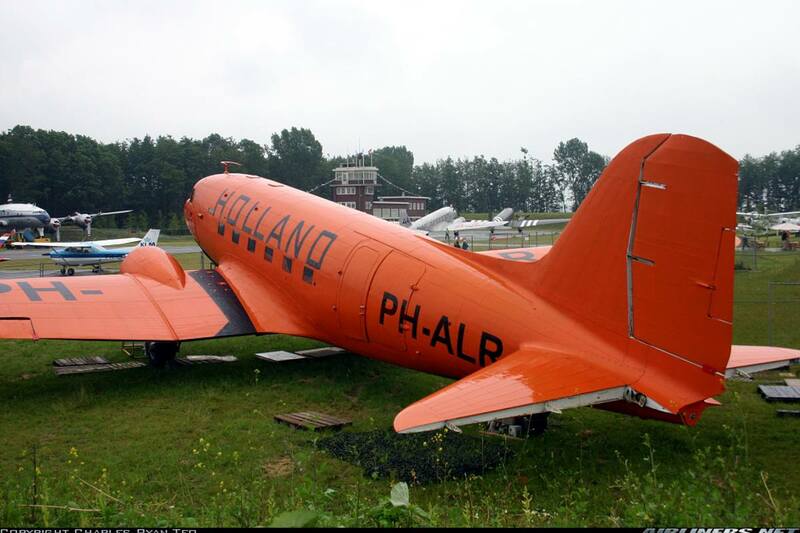 I photographed this beautiful DC-3 at Lelysted Airport, this is where I caught sight of many classic airliners. This aircraft is the successor of the DC-3, with a larger capacity introduced in 1942 to 1947. As you know, world war was happening during that period, so not many of this aircraft was built. 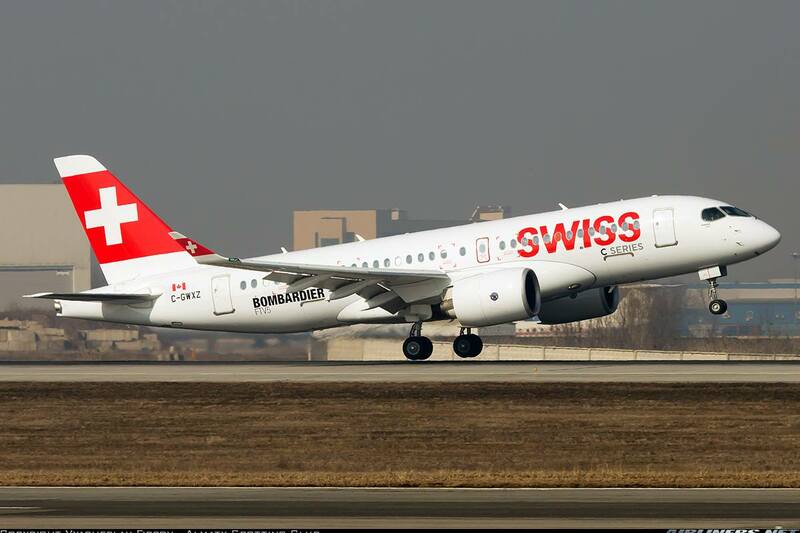 This aircraft can hold a capacity of 40 to 80 passengers and have the range of up to 6,839km. This aircraft's first flight took place in 1939 and was the first DC aircraft to have 2 engine options for customers to choose: Pratt and Whitney and Wright engines. 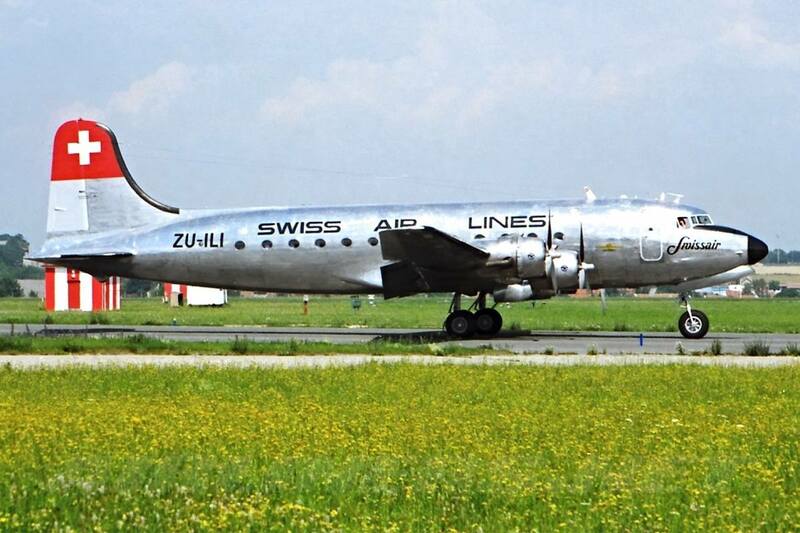 Smaller in size compared to DC-3 and DC-4, this aircraft can carry up to 24 passengers and has a range of up to 2,575 km. This is a rare aircraft type for the passenger series as only 5 were built, one prototype and the others are production models. 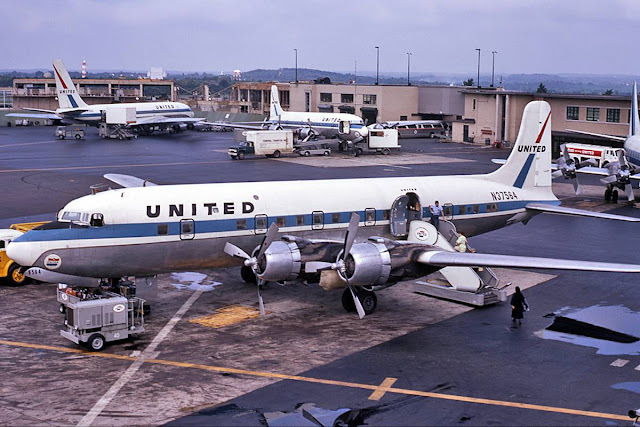 The DC-6 was designed to replace the DC-4 with a longer fuselage and more powerful engines. 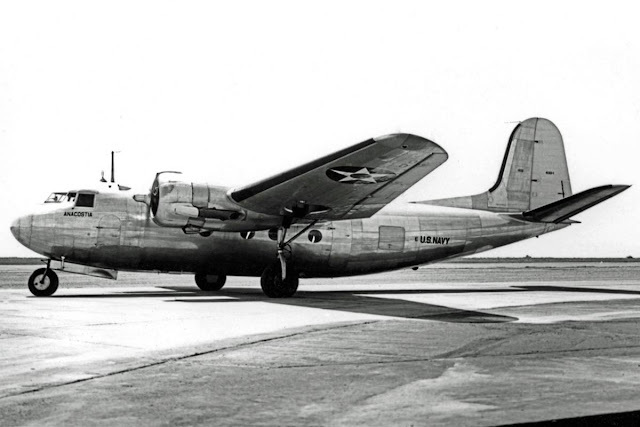 The first aircraft flew in June 1946 and managed to gain some orders from the airlines during the post-war period. This aircraft has 3 types: standard, DC-6A and DC-6B. 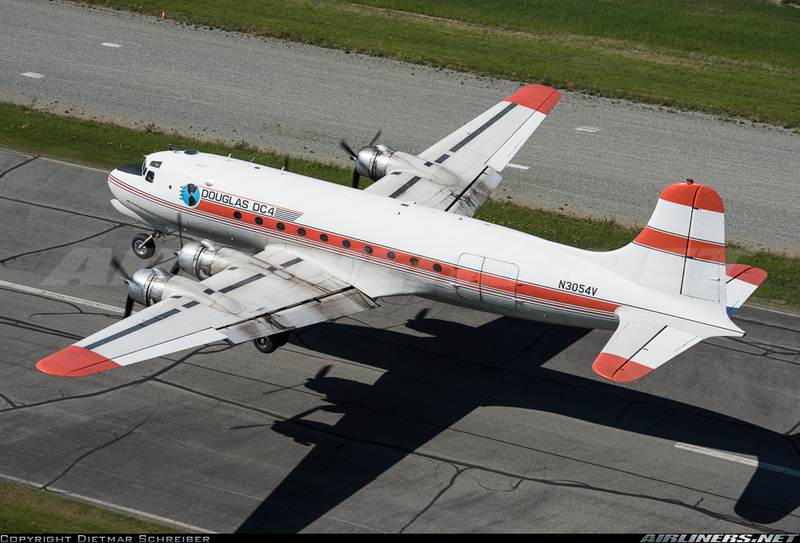 DC-6A is the freighter version while DC-6B carries more passengers than the standard version. 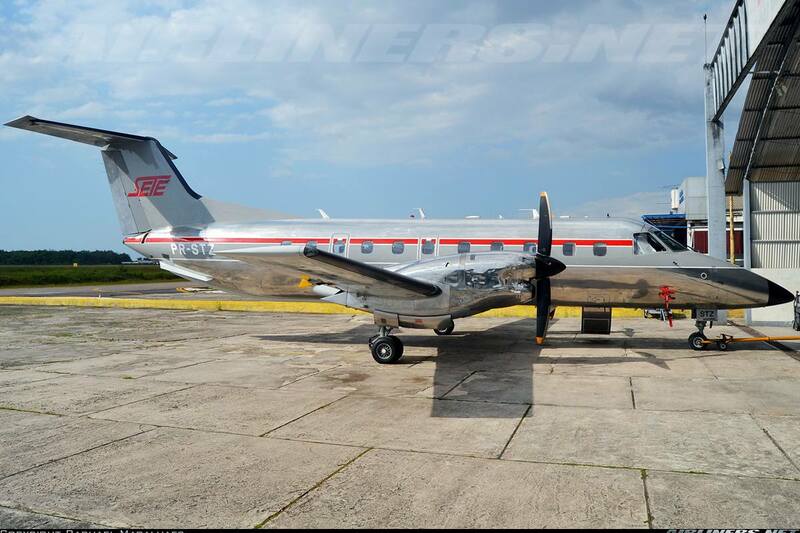 This aircraft was built in 1953 and the manufacturers releases a few version to meet the requirement of the airlines. The versions are standard, DC-7B, DC-7C , DC-7D and DC-7F. Basically the DC-7B and DC-7C are improved versions over the standard with the 7C capable of flying non-stop transatlantic. 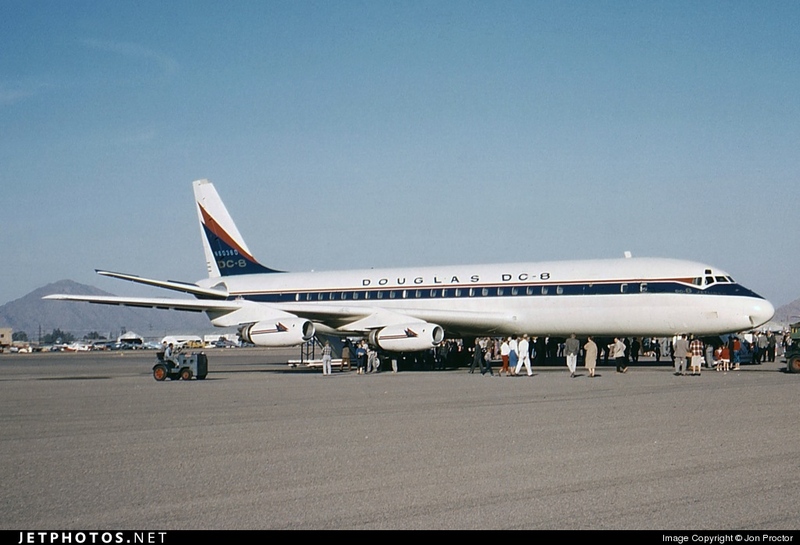 The Jet age of Douglas aircraft began with this aircraft, this was built to compete with Boeing's 707. This aircraft is a 4-engine long range narrow-body jetliner built by Douglas from 1958 to 1972. 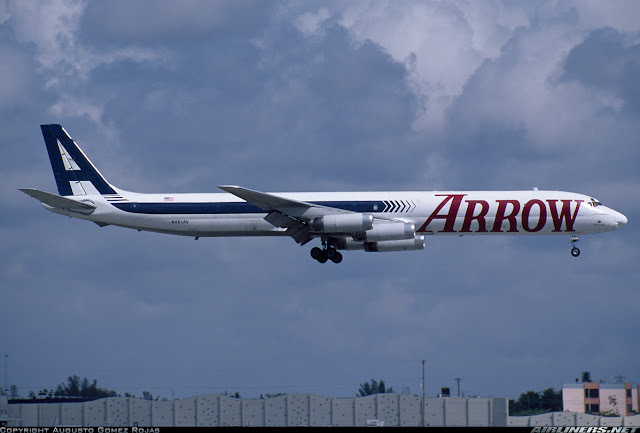 This aircraft type has many versions built to compete and meet airline's configuration and near the end of the production, this airline offered re-engined DC-8s especially for the Freighters and some of them went on until to the early 2000s. 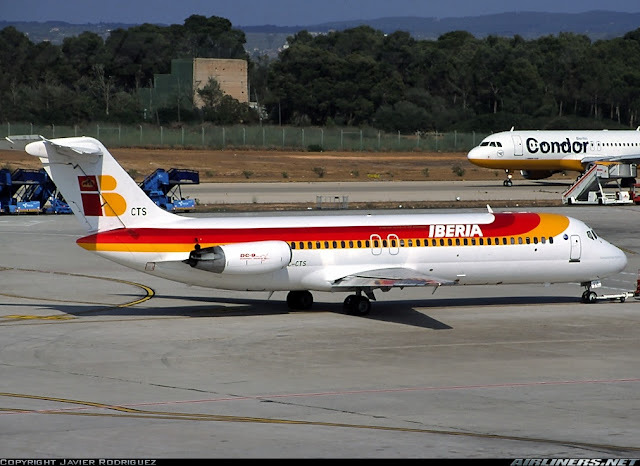 There are 7 different series for this DC-8. Improvements were made gradually on each series with capacity and improvements in engines mainly. The series are -10, -20, -30, -40, -50, -60 and -70. 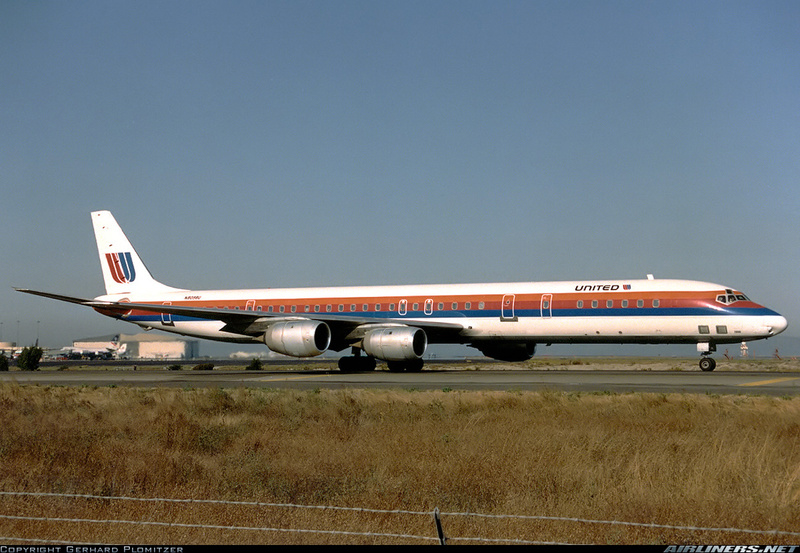 This is the original DC-8 configuration built for domestic use and only 28 of this type was built. The -20 series is an improved version of the 10, it has more powerful engines and doesn't require water injection. The weight of the aircraft is also heavier. This aircraft has 1/3 bigger capacity fuel size than the -10 and -20 series, with strengthened fuselage and landing gear. 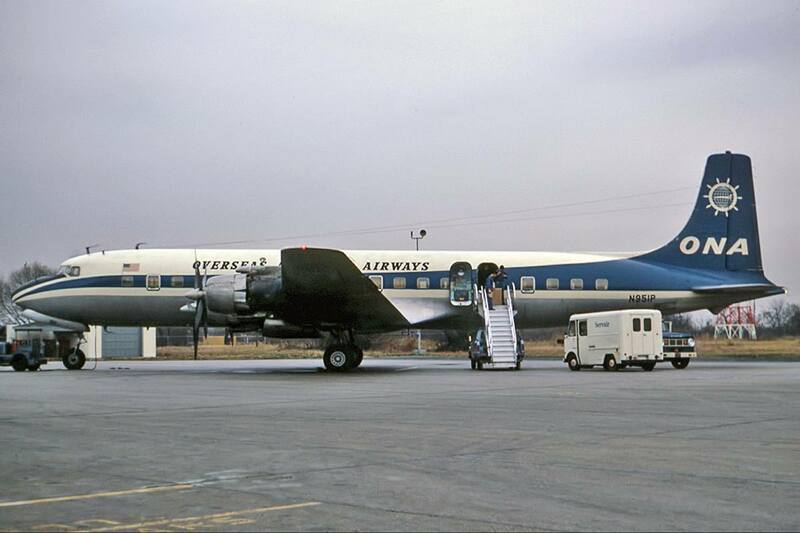 Mainly used for transcontinental routes and this aircraft's certification came in March 1960. 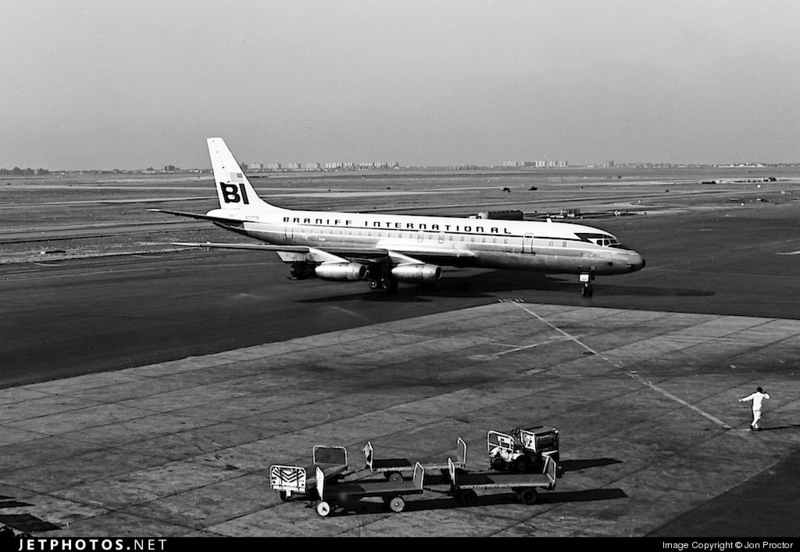 This is good old Braniff International Airlines, a defunct U.S Carrier, have different colour livery on their aircraft. 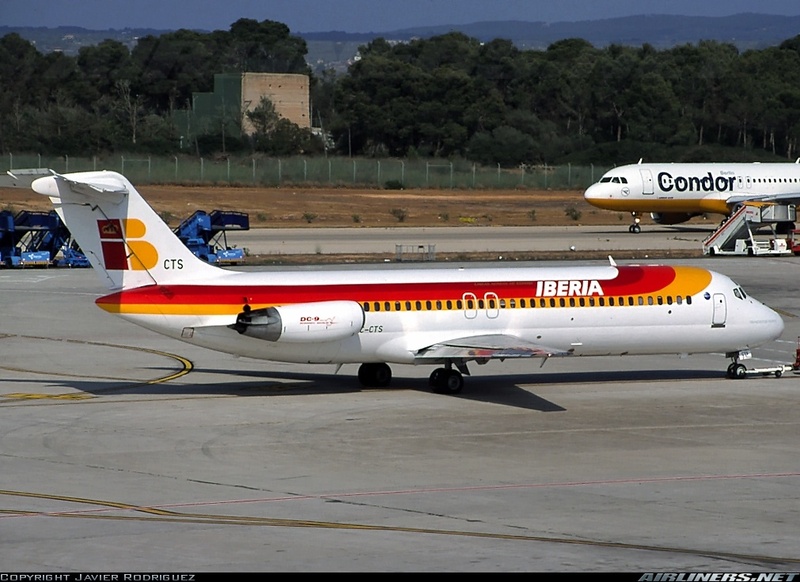 For this photo below, this is the airline's DC-8-31 series. The DC-8-40 series is similar to the -30 but is powered with Roll Royce Conway 509 turbofan engines for better efficiency, less noise and less smoke. 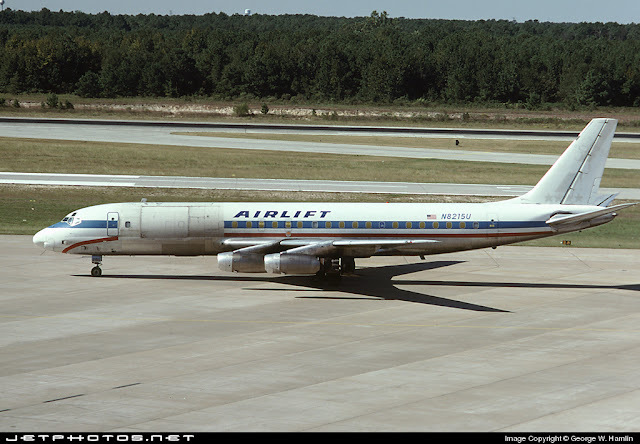 The series 50 is a shorter version and uses the same Pratt and Whitney JT3D engines with the Boeing 707. There are -51, -52, -53 and -55 with the latter being the most powerful of this varient. What's the difference between this type? The weight of the body and the different power thrust of the engines. These series was built in the early 1960s and was quite popular with the airlines. The -55 arrived later than the others with strengthened fuselage for the freighter version with higher maximum weight. 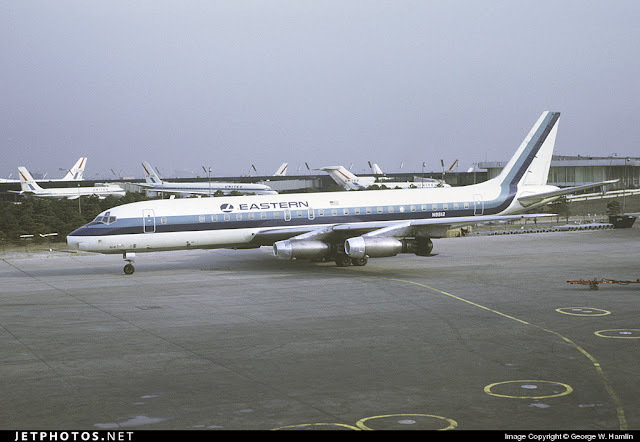 DC-8 Jet Trader and EC-24A models are based on this series. The series 60 is an improved version over its elder siblings. Douglas came out with 3 types for this series, the -61, -62 and -63. Each of them play a major role for the airlines they serve. The Series 60 was introduced in the middle of 1960s with the -61 coming out first followed by the other two types in order. The -63 is the longest version while the -62 is the shortest. Basically using the -61, Douglas stretched the fuselage to enable the more capacity to it. Other improvements to the wings and engines were made and of course the range and capacity play a role to these differences. This aircraft was designed for high capacity and medium range routes and the design is based on the -55 series model, main difference is the -55 range is sacrificed for capacity. This is the longest among the -60 series. This aircraft entered service in June 1968 and is a stretched version based on the -61 series. With an increased fuel capacity of the -62 and more powerful engines to power this aircraft. The DC-8-71 to 73 version were straight forward engine upgrades for the -61 to -63 series. The -61 to 63 were powered by Pratt and Whitney JT3D engines and the -71 to 73 were powered by more efficient engines, CFM56-2 high by-pass turbofans which offer quieter and less smoky engines, not to mention how fuel efficient it was. 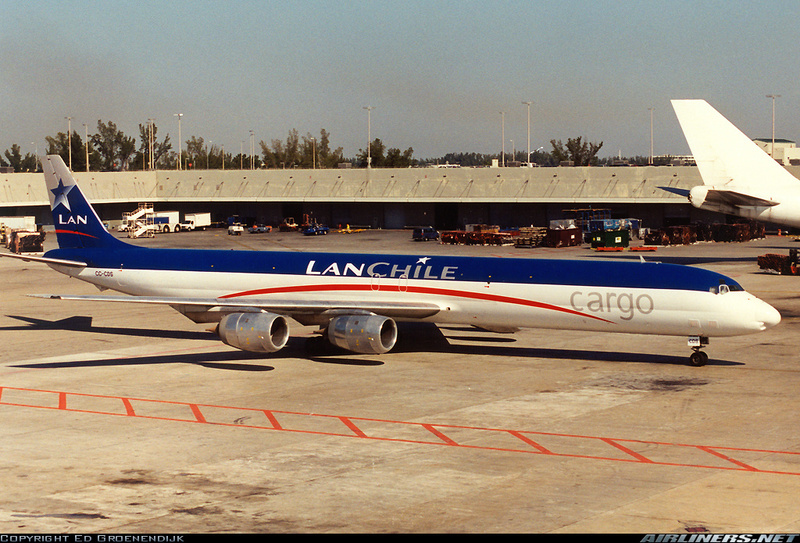 This is one of the reasons why the DC-8 life last longer than the 707 for the Cargo operators. 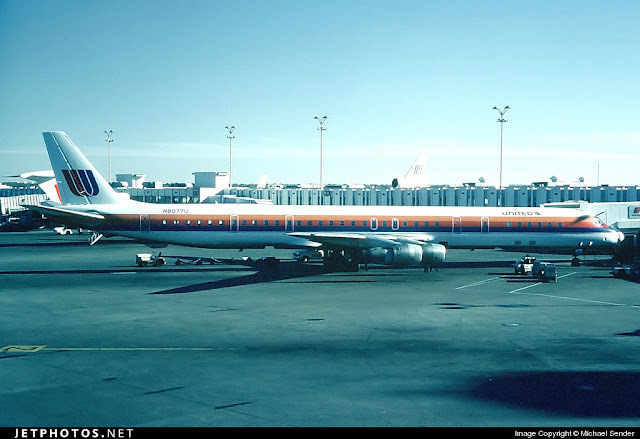 Douglas built the DC-9 in 1965 to compete with Boeing's 737. It was a twin-jet engine built for short-medium low capacity routes and what's unique about this aircraft? 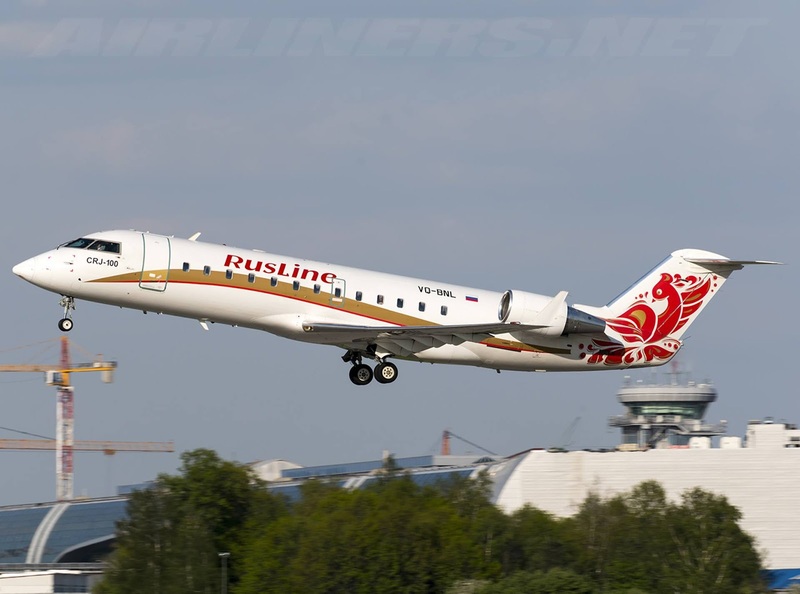 Its twin engines are located at the rear and its t-tail makes it easy to recognise and like the Boeing 737, its powered by the popular Pratt and Whitney JT8D turbofan engines. This aircraft has many different series, -10,-20, -30, -40 and -50. Basically, they are different in capacity and improvement in the aircraft were made after each series. 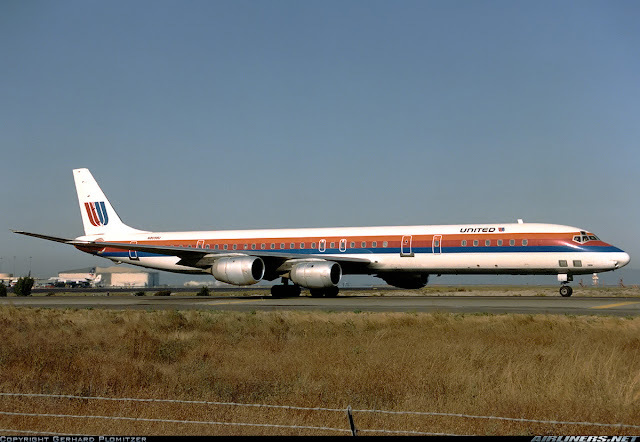 First flight of this aircraft took place in September 1968 and has gained quite a number of orders especially from the likes of Northwest Airlines. This is the smallest member of the DC-9 family, its similar size to the BAC 1-11 which also features the T-tail and rear engines. 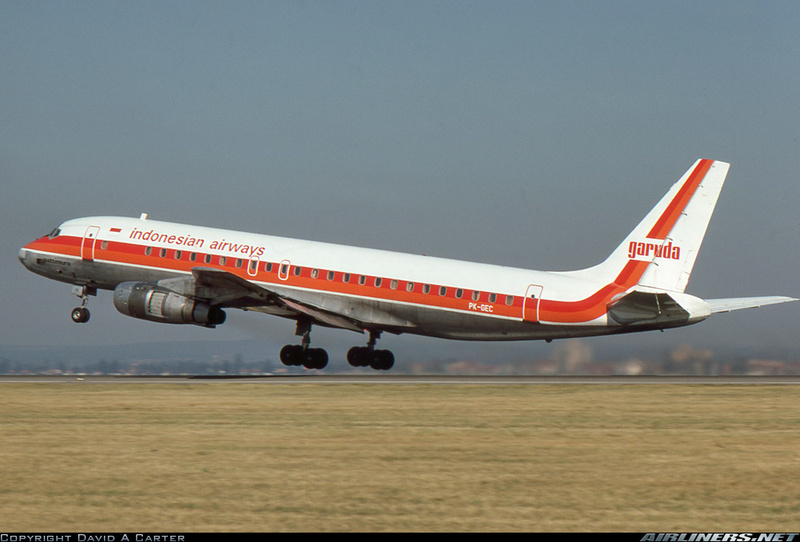 Its designed to take off from short runway and is quite popular with airlines in the mid 1960s. This is Aero California DC-9-15. Looks very short right? Looks quite similar in size, right? But as you can see the difference between both aircraft, the tail and the nose is very different. This aircraft was built in 1968 and its uses the same wing as the -20, -30 and -50. It uses lesser fuel capacity and shorter fuselage than the -10 but more powerful engines, as SAS requested for this aircraft type for better performance for short airfields. 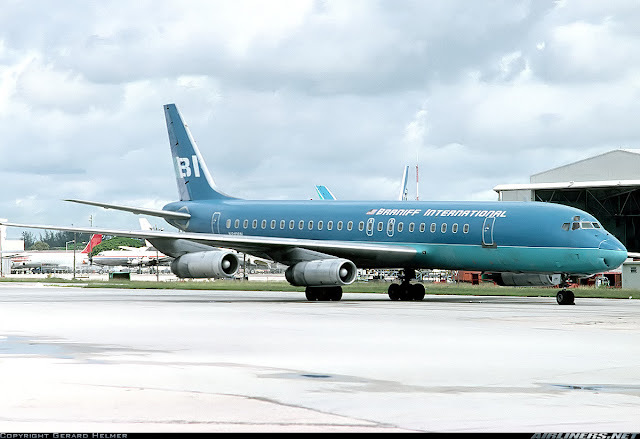 This model was quite popular with the airlines as it took up 60% of the total order of the DC-9 family. 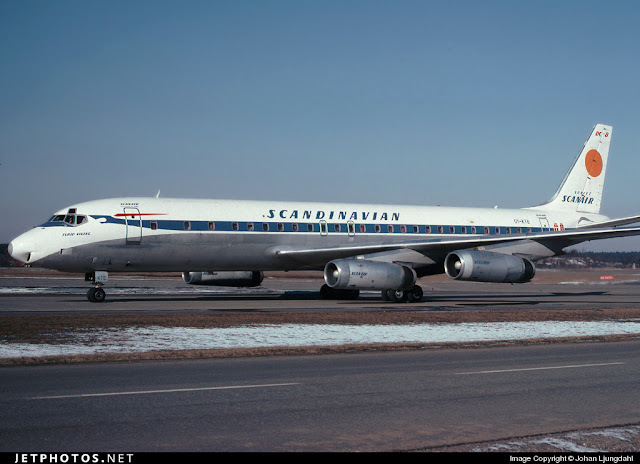 This model was the actual competitor to the Boeing 737 as its stretched fuselage and wingspan enabled it to fly further and carry more passengers. Introduced in 1966, Douglas built 4 series of this model, the -31, -32, -33 and -34. 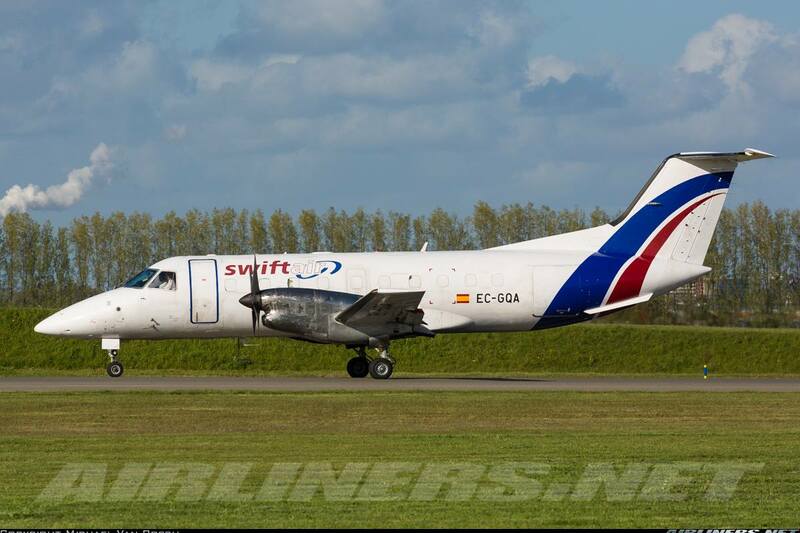 The -31 is for passenger used only, while the -32,-33 and -34 comes in a choice of passenger, combi and freighter aircraft. -34 is the most powerful of this series. 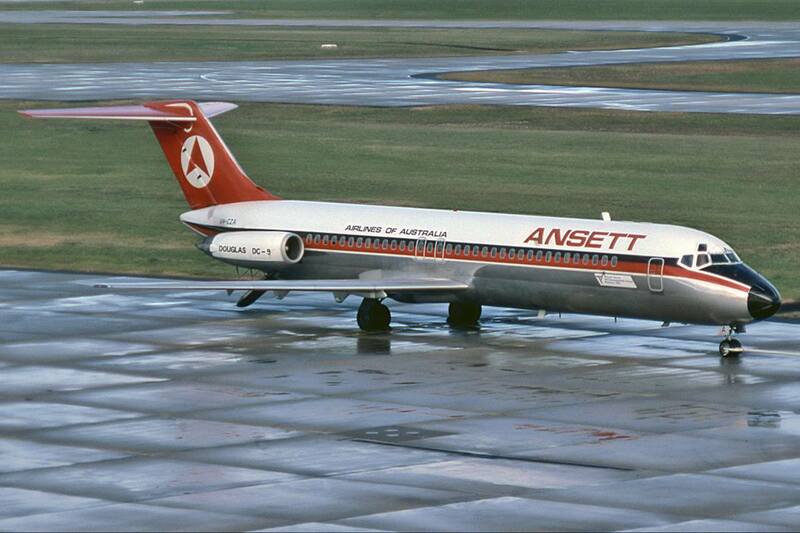 Ansett's Australia DC-9-31. 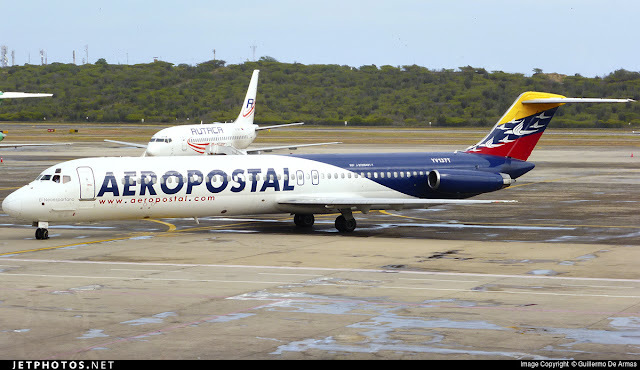 How many of you miss this airline? This is the stretched version of the -30 and can hold more passengers than its elder siblings. Using more powerful engines, the aircraft was introduced in March 1968. 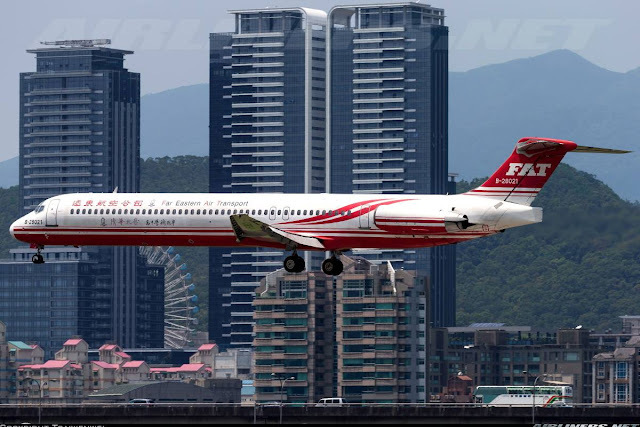 This is the last series of the DC-9 and the largest of this aircraft type. With a longer fuselage, it also had improvements on its cabin and more powerful engines. 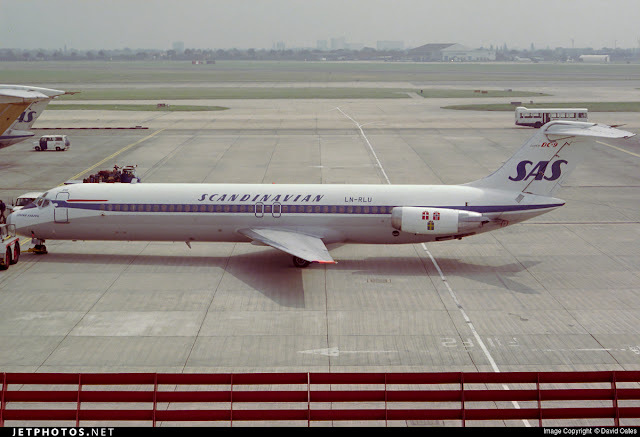 This aircraft was introduced on August 1975. 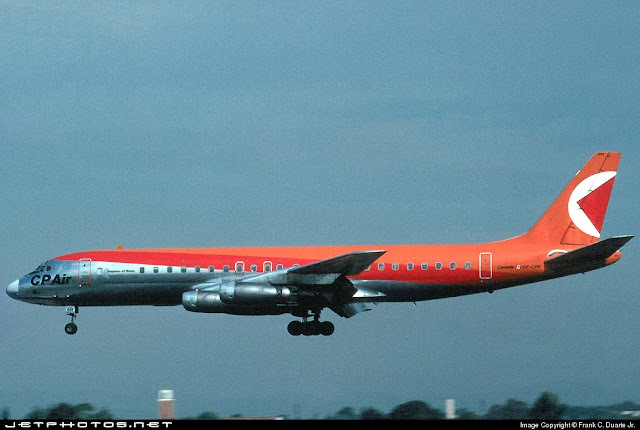 Douglas Aircraft built the DC-9 in the mid 1960s for short-medium range, small capacity size purposes. 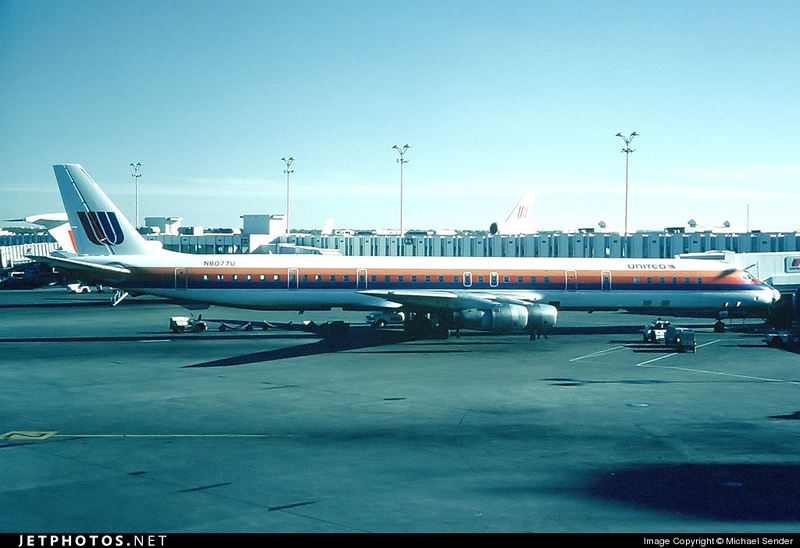 As competition with Boeing is quite intense, newer and more efficient aircraft were needed to meet the growing boom in the travelling industry,so Douglas built the 2nd generation of DC-9, originally known as the DC-9-80 and entered service in 1980. 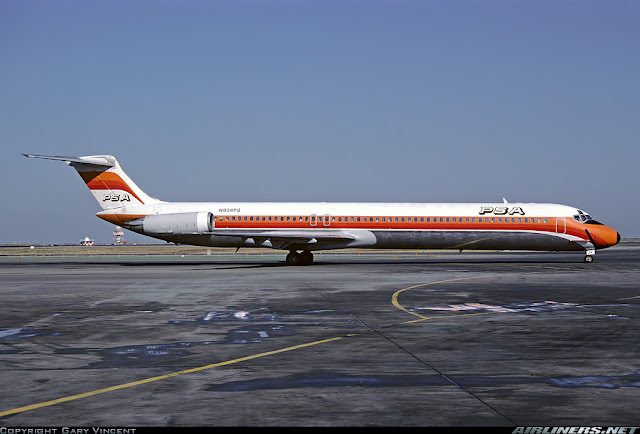 Later on, McDonnell took over Douglas to form McDonnell Douglas and in 1983, the DC-9-80 series was renamed to the MD-80 for marketing purposes. 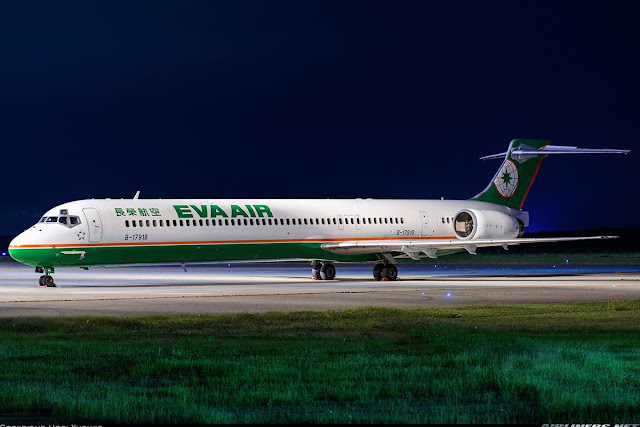 The MD-80 design comes from the DC-9 and its a stretched version with more powerful engines, larger fuel tanks and other cockpit improvement. This aircraft has several series, they are MD-81, -82, -83. -87 and -88. 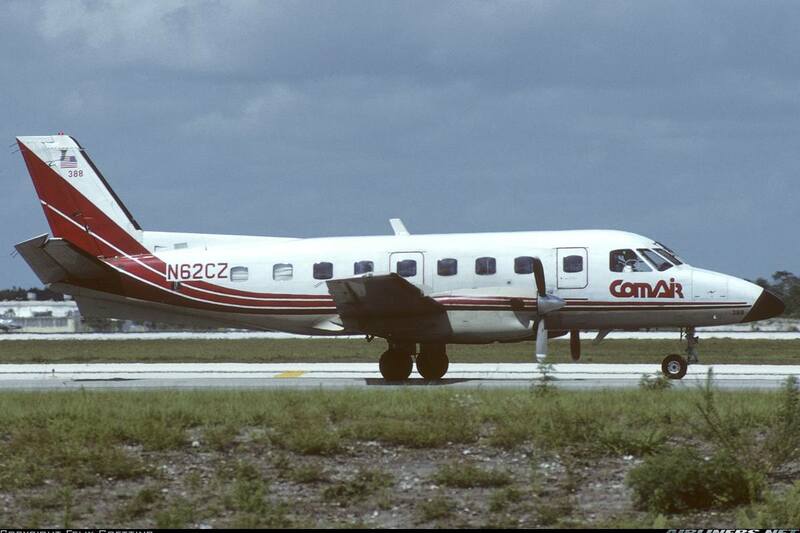 This aircraft made its first flight in 1979 and shares the same fuselage length as MD-82, MD-83 and MD-88. What are the difference between these aircraft? Different engine variants, fuel capacities and weight. 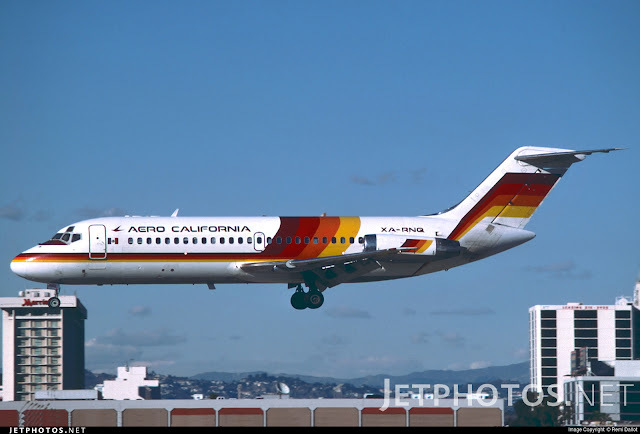 This aircraft was equipped with more powerful engines to the MD-81 series and was intended for operation from 'hot and high' airports. Not only that, it also offered greater range. Later on, this model was assembled with licence by Shanghai Aviation Industrial Corporation in China starting from November 1986 with the body kit flown directly from the American manufacturer and built in Shanghai. This is Taiwanese carrier, Far Eastern Air Transport MD-82. 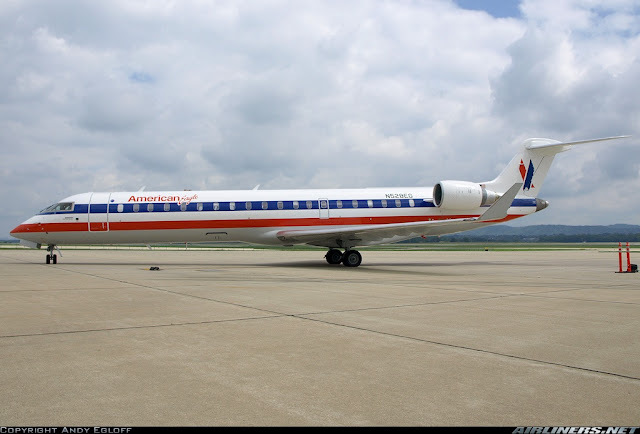 I am fortunate to have flown on this airline's MD-82 a few times. 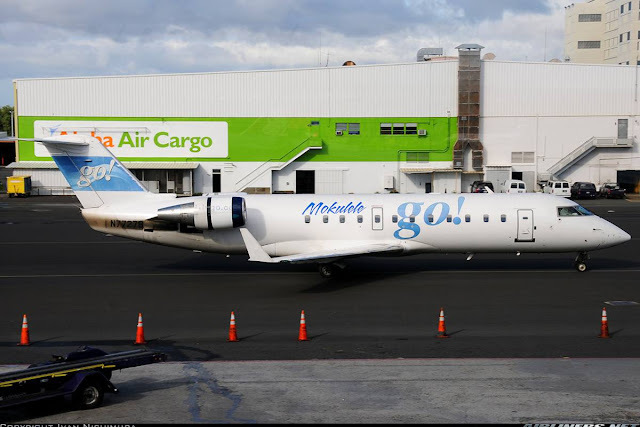 The MD-83 shared the same fuselage as the MD-81 and 82, but it has a larger fuel tank, more powerful engines and higher weight than the other two. Its first flight took place in December 1984. 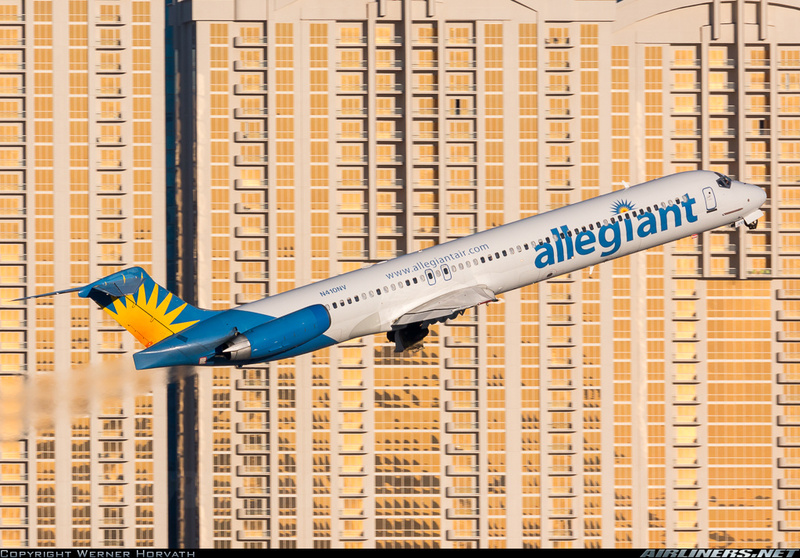 This is Allegiant Air's MD-83, the airline is based in U.S. 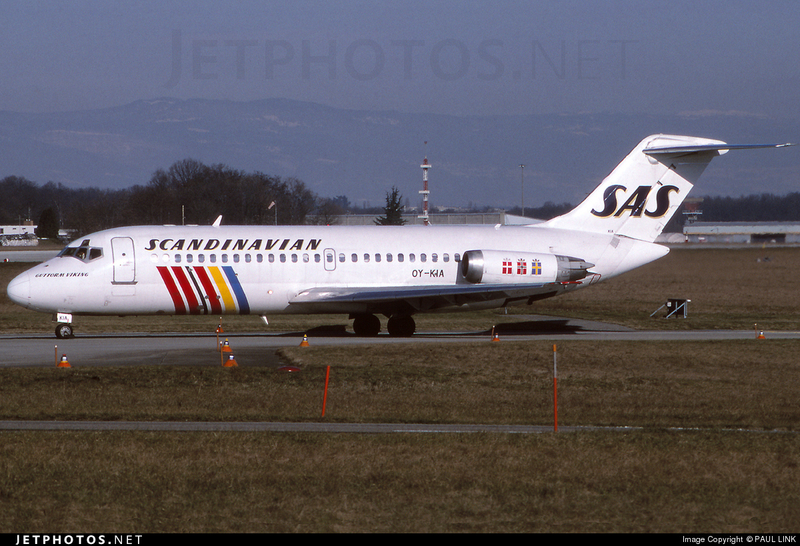 This is the shortest variant among the MD-80 series. Its intended for longer range routes with slightly smaller capacity than the other MD-80 series. It made its first flight in December 1986. However it sold lesser than the other series. 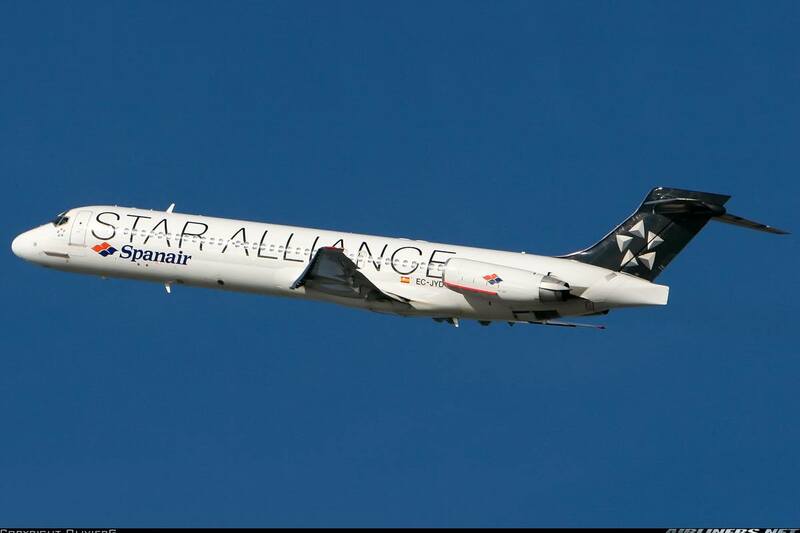 My ride and only ride of this aircraft type goes to this aircraft, defunct airline - Spanair in the 'star alliance' livery. Do you notice how short it is? 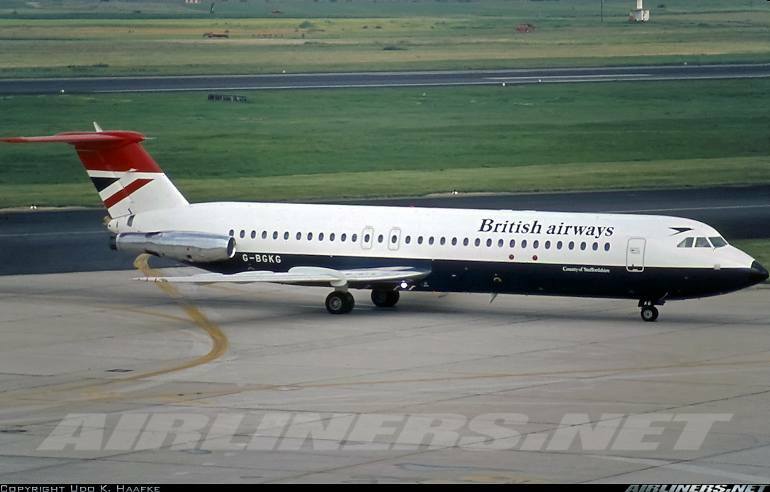 This is the last version of this aircraft series and was first flown in August 1987. The size of the aircraft is identical to the MD-81, -82 and 83 series but is an improved version over the others, such as improved cockpit for the pilots. MD-90 is an upgraded version of the MD-80 with newer and more efficient engines, powered by the IAE V2500 engines. This engine also powers the Airbus A320 CEO (Current Engine Option) family. 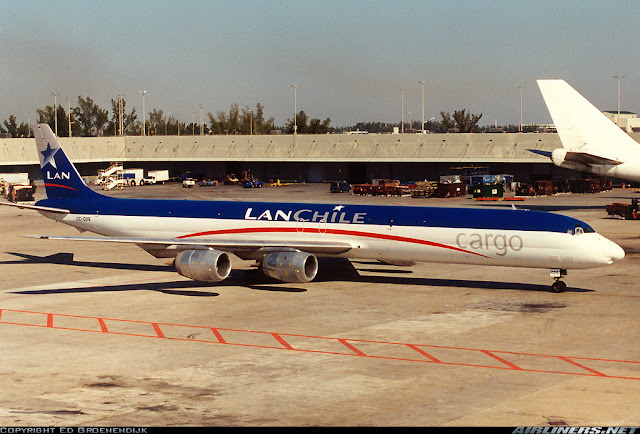 This aircraft is also slightly longer than the MD-81/-82/83/-88 series and features similar cockpit to the MD-88. This aircraft has 2 versions, the standard and the -ER version. The -ER has a higher gross weight and flies longer distance than the standard as it has an auxiliary fuel tank. 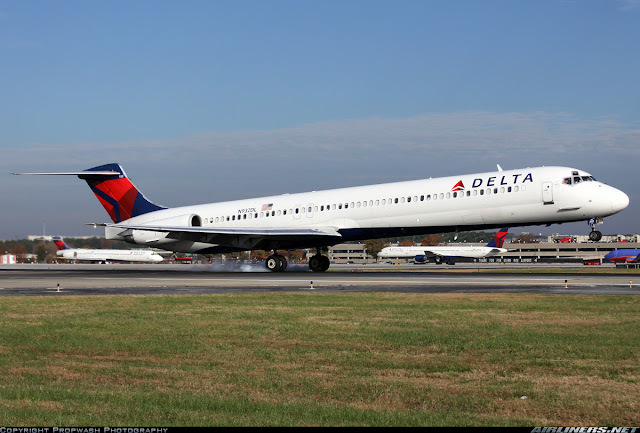 MD-95 was built and renamed to Boeing 717. For more info, please check my Aircraft Recognition Guide part 1. 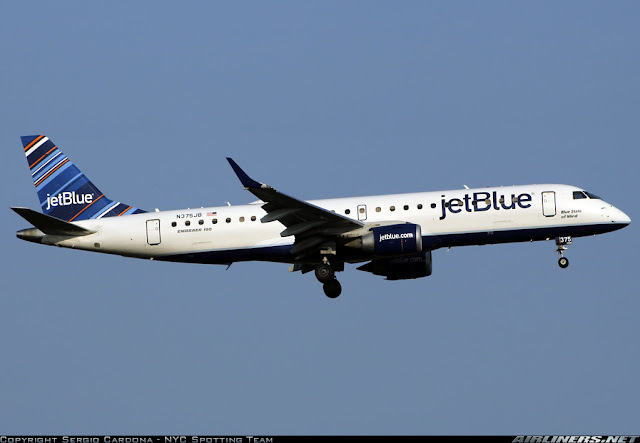 This is Blue1's Boeing 717-200. 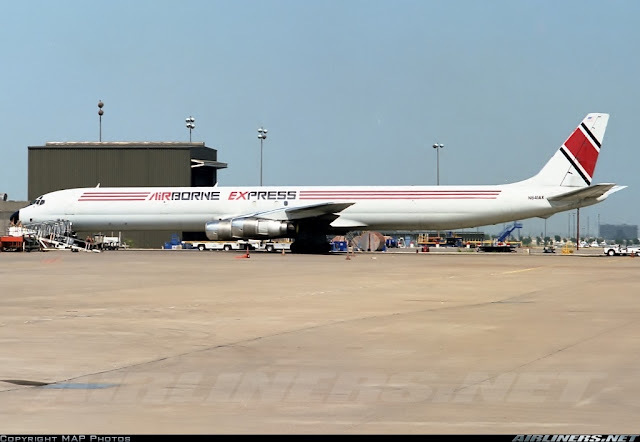 This aircraft is a 3-engine built by McDonnell Douglas to counter Boeing's 747 aircraft. It is used for medium to long haul flights with a capacity of around 380 passengers. 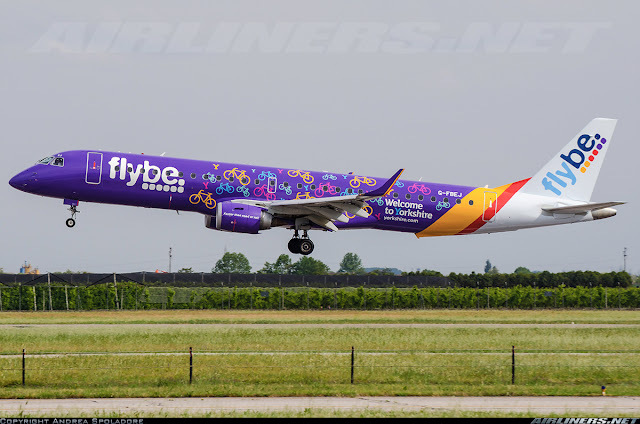 It may not have a good safety record at the start but gradually it improved but this could be one of the reasons for this manufacturer to start bleeding money and eventually taken over by Boeing. 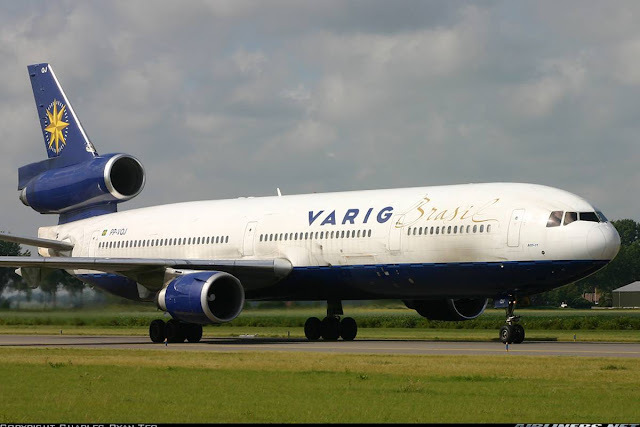 With some high profile crashes, this manufacturer struggled to gain new orders and the lack of confidence with the MD-11 - a replacement of this aircraft could have been a role to many airline's decision to buy other aircraft. 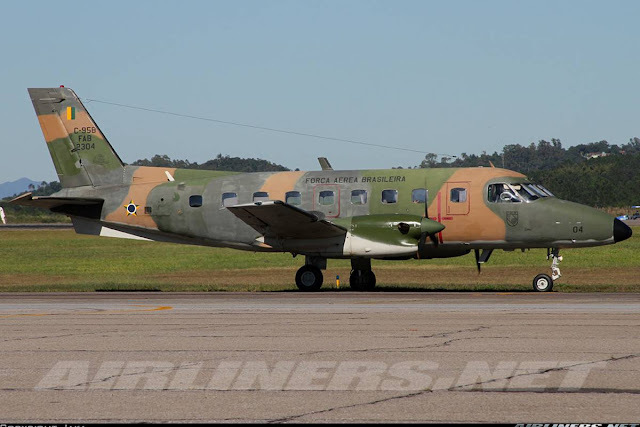 This aircraft has a few variants - the -10, -10CF (Converted Freighter), -15, -30, -30CF and -40. Later on, the DC-10 was offered a retrofit of the cockpit similar to the MD-11 and this redesign was renamed to MD-10. The advantage of this new cockpit is the elimination of the fight engineer, means the MD-10 only requires 2 pilots to fly the aircraft. 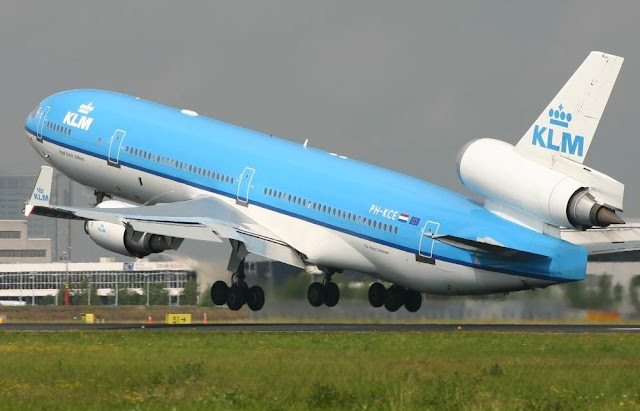 There is no difference in looks between the DC-10 and MD-10. This is the initial version, first commercial aircraft to be equipped with General Electric CF6-6 engines. 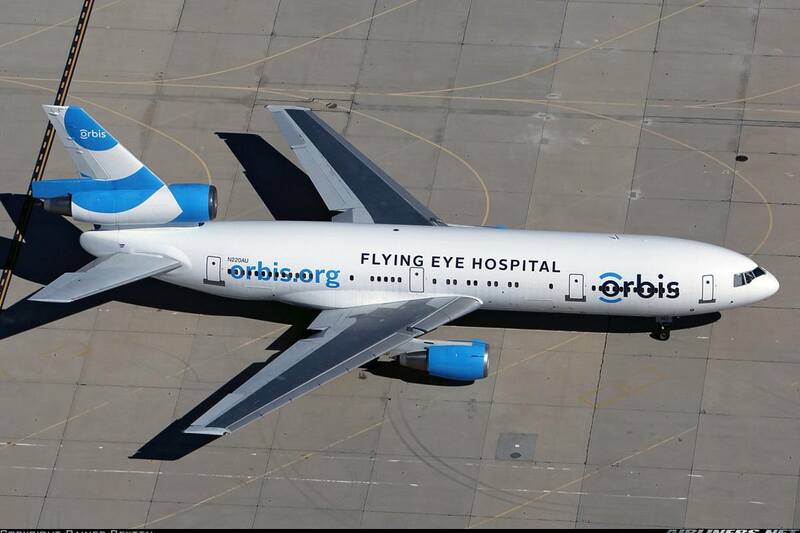 This is DC-10-10 of Obris Flying Eye Hospital. This aircraft was designed to use at hot and high airports. The difference between this and the -10 is this aircraft was fitted with more powerful engines. 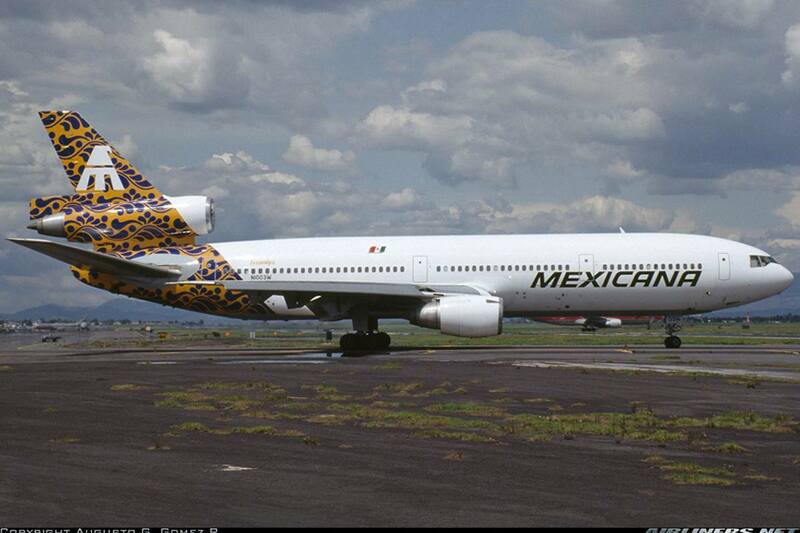 This is Mexicana's DC-10-15. 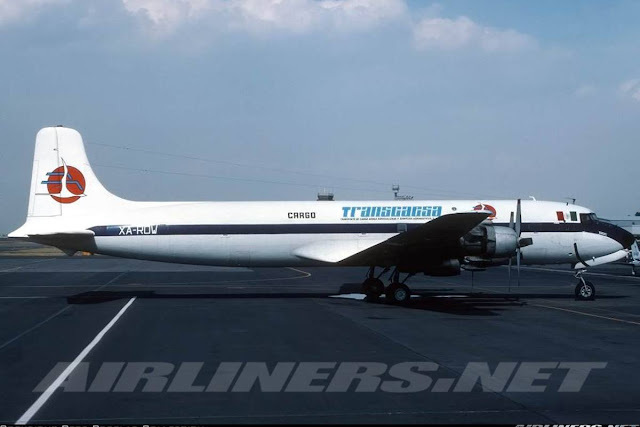 Only Aeromexico and this airline operated this version. This series had the standard and the ER (Extended Range) for passengers aircraft and Freighter. This is the most popular among the DC-10 family. Comparing with the other series, this aircraft had extra fuel tanks, more powerful engines and a set of rear centre landing gear to support its weight. 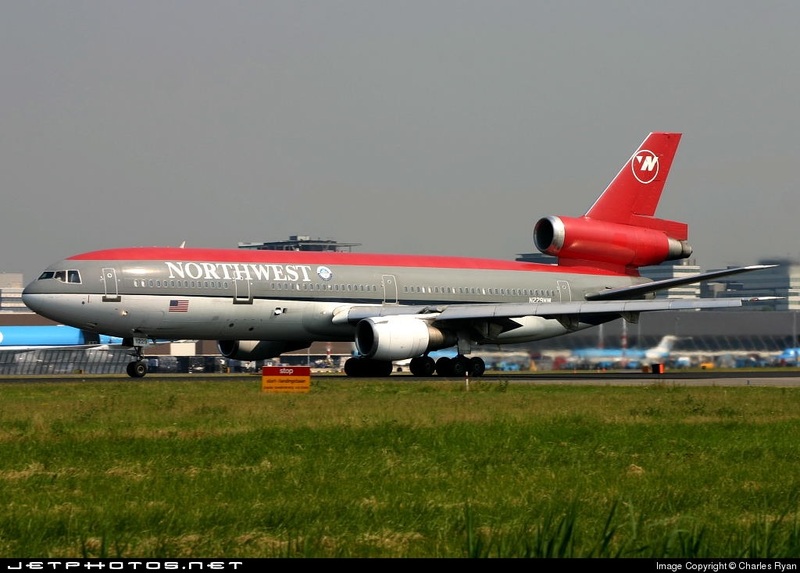 This is my photo of Northwest's DC-10-30 series, photographed at Amsterdam Airport. This was originally supposed to be the DC-10-20 series but was specially requested by Northwest Orient Airlines to change it to this number. This aircraft is based on the -30 series with more powerful engines. This is Japan Airlines MD-11, JA8585. My favourite aircraft among all! Why? This aircraft is considered my lucky plane, everything I see it at Changi Airport, it brings me luck as I would see something special at the airport. Although I miss the chance of flying this beauty, she will always be in my list of favourites. Now currently operating with UPS as a converted freighter. This is the freighter version, very popular among cargo operators. 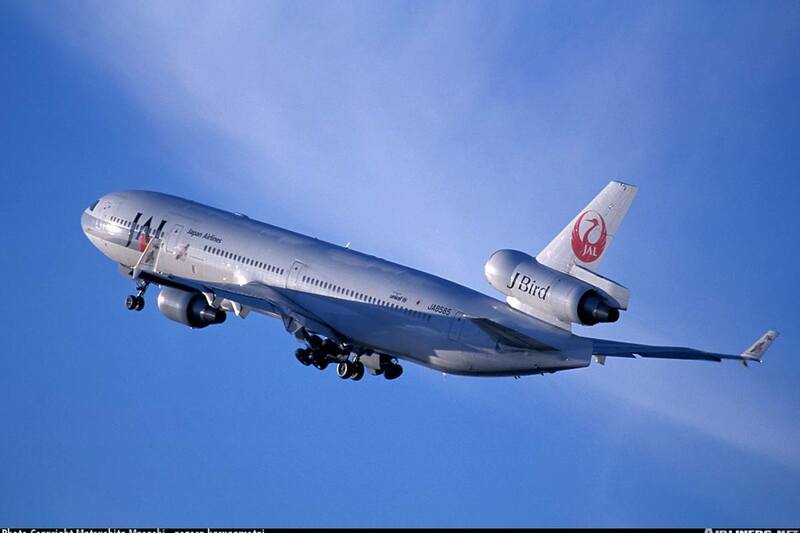 This aircraft is being phrased out for more efficient aircraft such as the Boeing 777 Freighter. Thank you for reading this, if there are any mistakes please let me know.